Just a quick one due to it being Christmas Eve and I have lots of Santa duties. Mostly drinking the beers my kids left out for the big bearded man. I will be updating Pipeburn as much as possible over the holidays but will also be doing some guest writing on one of my favourite motorcycle sites BikeExif. Check it out if you don’t already. 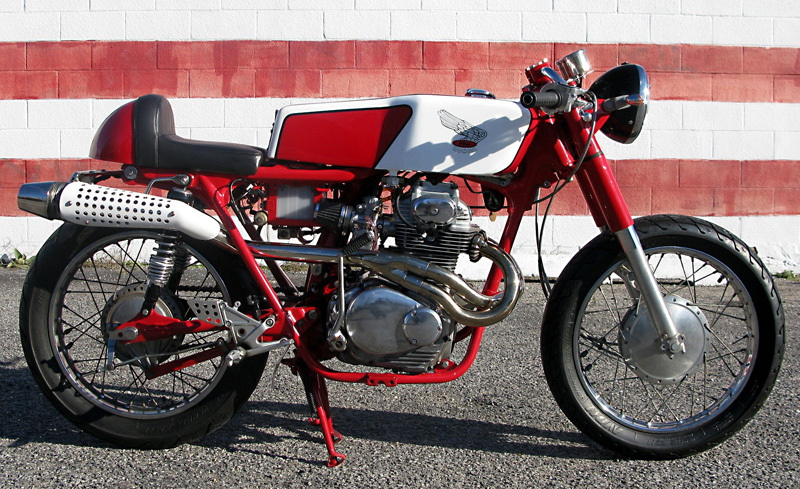 Found this Honda CL350 cafe racer on the unusually named motorcycle blog watermelon18. Kenny, the owner of this motorcycle and blog is no professional bike builder, “just a guy who’s always liked the old style racers and decided to try and make his own”. We think he has done a sensational job. This is the delicious new 2010 Triumph Thruxton Cafe Racer Special Edition. Expected to be released in July 2010, it’s essentially the same Thruxton just with a striking red, white and black retro paint job. The other new feature is the cafe racer style headlight cowl. We really dig the red powder coated frame and red stripe that runs down the tank and cowl. The Special Edition Thruxton will have the same 865cc air-cooled, twin cylinder that makes a pretty solid 69hp and 51lb ft of torque. They haven’t announced how much this bike will cost, no doubt Triumph will charge a premium for the privilege. You can definitely imagine Steve McQueen escaping the Nazi’s on the Royal Enfield Bullet 500 Military. This will surely be a favorite among military and history enthusiasts around the world. The Bullet 500 is not a bad looking ride (if you are a fan of Olive drab), especially for the base price of $5,545 USD. Although it looks like something your Grandpa rode in World War II, it has lots of modern features, like a highly-tuned engine that has 23 BHP at 5500 RPM. Recent updates include lower emissions and better fuel economy (75 mpg). If you like this bike you will probably also enjoy Harley-Davidson’s Military Appreciation campaign using supermodel Marissa Model. It definitely got my soldier standing up at attention.